Am I in Labor and Need to Go to Hospital? One of the things expecting parents often worry about as they approach the end of the third trimester is knowing when it’s time to go to the hospital or call the midwife. While it is not uncommon to think that the first contractions are your cue to leave, it's usually not the case. Early labor can sometimes last for days, and, in some cases, may not even be true labor contractions. By understanding the stages of labor—and the measures by which we mark them—you can greatly reduce your stress and avoid multiple trips to the hospital. The birth of your child is a unique event. No two deliveries are alike, and there is often no way to know how long it will take or what it may entail. With that being said, childbirth will invariably progress in three clearly defined stages. The first stage begins with the onset of true labor and continues until the cervix is fully dilated to 10 centimeters. This is followed by the second stage (the period between 10 centimeters and delivery) and the third stage (the delivery of the placenta). It is during the second of these three stages—active labor—that we can start making the move to the hospital or birth center. Early labor is the least painful but longest of the three stages, usually lasting between eight and 12 hours. Contractions will occur every five to 30 minutes and typically last 30 to 45 seconds. In most cases, doctors will advise you to stay home until the contractions are closer together and longer lasting. Active labor roughly begins when the contractions come every three to five minutes over an hour-long period and last for 45 to 60 seconds. The stage will typically last for three to five hours. If this is your first baby, you would go to the hospital now. If you've had a child before, you may be asked to come earlier when the contractions occur every five to seven minutes. You should also go to the hospital if your water breaks, whatever the stage. By doing, your doctor can check the health of the pregnancy and proceed with assisted labor, if necessary. Despite what some may tell you, the dilation of the cervix alone does not determine when you are in a labor. In some cases, a woman may only be dilated a centimeter but experience strong and frequent contractions. Others may experience dilation even before labor begins. To this end, once you've arrived at the hospital, you would be given a pelvic exam to determine how dilated your cervix is. In addition, the doctor would look for the characteristic shortening and thinning of the cervix, known as effacement. Effacement is the process, along with dilation, that allows the baby to move into the birth canal. Effacement is measured in percentages, with zero percent meaning no thinning of the cervix, 50 percent meaning half the normal thickness, and 100 percent meaning fully thinned. In the end, there are no hard and fast rules. For example, if you are less than 3 centimeters when you arrive, are not in a lot of pain, and are not planning to use an epidural, going home may be the most reasonable and comfortable option. However, if your water has broken, you are in a lot of pain, or have special medical needs, staying may be the better choice even if you are less dilated. 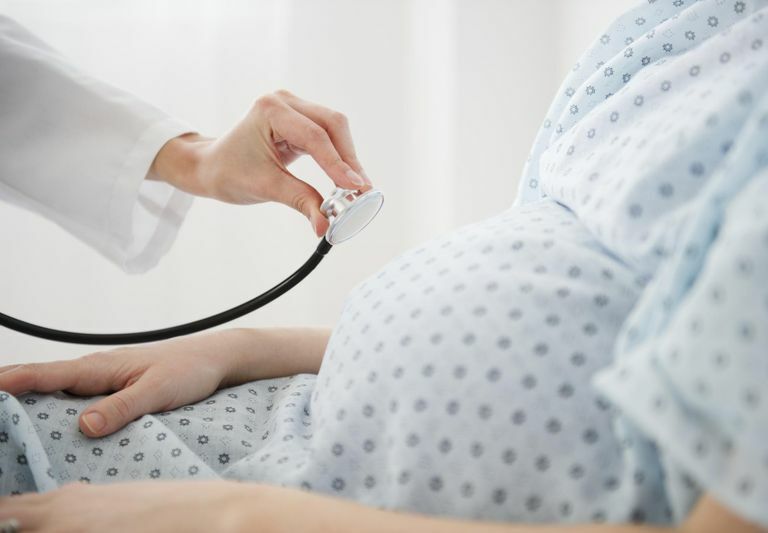 Generally speaking, once you are past 5 or 6 centimeters and having regular contractions, most practitioners will be fairly insistent that you remain in the hospital until your baby is born. Sometimes a contraction may not be the sign of true labor. If a contraction is erratic in frequency and strength, it may be something called a Braxton Hicks contraction, also known as false labor. Braxton Hicks contractions can develop as early as the second trimester but are more common during the third. While true labor is characterized by contractions that are regular, increase in strength and frequency, and do not change if you move or change position, Braxton Hicks contractions are irregular, do not increase in strength or frequency, and often stop when you walk, rest, or switch positions. Moreover, compared to true labor contractions which usually start in the lower back and move to the front of the abdomen, a Braxton Hicks contraction will be constrained to the lower abdominal or pelvic region. While it is easy to mistake a Braxton HIcks contraction for a real one, always watch the pattern to decide whether you are experiencing true labor or a false one. Knowing the difference can save you a wasted trip to the hospital. Hanley, G.; Munro, S.; Greyson, D. et al. Diagnosing onset of labor: a systematic review of definitions in the research literature. BMC Preg Childbirth. 2016;16:71. DOI: 10.1186/s12884-016-0857-4. How Long Is the Average Length of Labor and Delivery?